What is the point of reviewing Carrie Underwood’s Cry Pretty when the album artwork perfectly encapsulates the underlying strengths and crippling weakness of the project more succinctly than any critic could ever hope to? Okay, perhaps the relationship between these thirteen tracks and that one glossy image will take some explaining, but trust me, all the information you need to know is right there, staring you in the face. The American Idol’s sixth studio album is an important one: the usually unflappable Underwood has promised to bare her soul and create intimate songs that will shake her listeners to their core. The title track says it all, as the steely country star intones, “So I apologize if you don’t like what you see/Sometimes my emotions get the best of me/And falling apart is as human as it gets…you can’t cry pretty”. The words represent a genuine breakthrough for Underwood as an artist. She is vulnerable rather than imperious and as the album progresses it begins to overflow with images of a woman struggling to cope, but coping all the same, with heartache. And yet, just like the album artwork, Underwood’s production betrays her songcraft. 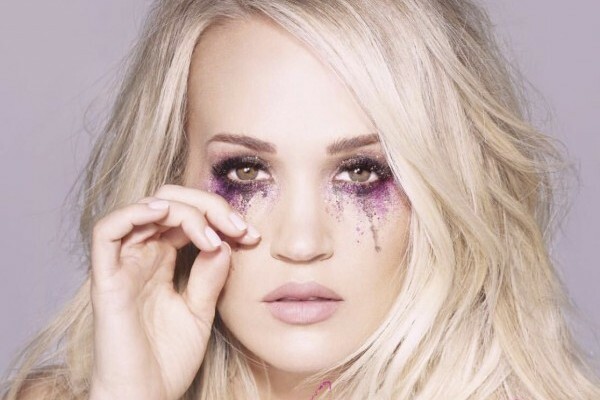 Cry Pretty – the song and album – is pitched for the stadiums and covered in a shiny veneer suitable for dominating modern country radio rather than crumpling up into a tear stained ball. The artwork puts lie to the lyrics, it appears Underwood is wrong, not only can you lie and smile pretty (like her cheating and commitment phobic lover), but she appears perfectly capable of crying pretty. Evidently, it was more important for Underwood to appear as an unflinchingly immaculate pseudo-supermodel on cover than the drunken, vengeful, wounded woman who inhabits these thirteen masterfully crafted tracks. This tension comes to define Cry Pretty: an album written to convey a depth of lingering sorrow, but constructed to ensure 50, 000 people packed into a stadium never actually feel bad. There is so much emotional ugliness and intricacy lurking on this LP, but heaven forbid it actually look or sound ugly. Suffice to say, the decision to so starkly contrast the substance of this album with its sound is down right infuriating, but that doesn’t necessarily result in bad music. Far from it, there’s just this looming spectre of an opportunity missed: Cry Pretty could, and should, have been so much more. Let’s not dwell on what could have been, especially when what Underwood has delivered is so unexpectedly potent. Finally, the Idol star has alighted on material as powerful as her skyscraper-sized lead vocal. “Ghosts On The Stereo” is an absolute masterstroke, the closest thing to a classic country gem in her entire oeuvre. The track opens solemnly, echoing Arcade Fire’s arena-ready-phrasing in the verse before the track balloons into an oddly upbeat chorus – Carrie, you see, is having a party with a bunch of great guys: Jack and Daniels are keeping her warm while Hank and Merle kick out the jams. It’s a delicious twist; Underwood is all-alone, probably in the dark, curtains drawn, in complete and utter denial, nursing her broken heart with the help of some country greats. Unfortunately, while the juxtaposition between upbeat stadium pop and the dark realities of her broken heart are intriguing, (and given that she alludes to the Nashville greats) a traditional arrangement would have been far more effective. Just imagine those lyrics and that vocal performance with the production and playing present on Miranda Lambert’s The Weight Of These Wings. There’s a focus grouped feel to the whole LP that persists throughout. It’s bothersome that opening trio “Ghosts On The Stereo”, “Cry Pretty” and “Low” have to share space with tedious pop concessions “End Up With You” and “Love Wins”. The former is particularly cumbersome, a horrid blend of insipid faux-indie guitars and bootleg Dua Lipa snap without any of her attitude or edge. For the first listen at least, listeners will have to hold their noses an accept that it is worth suffering through some neutered and offensively soulless arrangements to experience a narrative covered in bruises and soaked in bourbon. If Carrie is happy to tell us that she’s a hot mess of emotions and poor judgment, her producers should be brave enough to reflect her vulnerability in their compositons, rather than trying to sober her sound up with a heavy dose of raw coffee beans and synthetic energy drinks. Luckily there are a selection of radio-worthy efforts that do hit their mark. “Backsliding” might be clumsily loud, but the image of Carrie slipping back into the arms of a comfortable, but destructive lover proves powerful: “Why am I 2am picking up my phone, and you’re standing in my porch light, Backsliding”. The buoyant summer party jam “Southbound” is less fraught, but still effective as Carrie drowns her sorrows by slamming down budget Margaritas at the Marina. Alcohol as escapism is powerful theme on the album, from the aforementioned girls night out joy of “Southbound” to the lonesome, but not depressive comforts of “Ghosts On The Stereo”. “Drinking Alone” proves another triumph in this vein. The verse and chorus are so patterned they could have waltzed right out of 90s TV musical, but the wilting rhythm affords Carrie’s vocal a sense of ease and a playful character that is usually obliterated by its sheer volume. The story is simple, sitting at a bar, she’s happy to spend the night drinking alone with another broken heart: their bodies are together; their misery is their own. “That Song That We Used To Make To Love” should be a sure-fire hit despite its slightly lacklustre chorus. The verse, bizarrely, apes John Grant’s devastatingly dark “Queen Of Denmark” before zigzaging into an airy Balearic pop chorus. Offering another unique spin on the lingering ache of memory, Carrie revels in rose-tinted-nostalgia for a long lost relationship. She won’t delete “their song” nor will she stop playing it. It’s her own little in joke, it might represent a kind of wallowing, but it’s also a pathway to recapturing a joy she can no longer experience first hand. After all, who said heartbreak has to result in blind bitterness? “The Bullet”, a reflection on the personal and communal effects of gun crime, and “Spinning Bottles”, a meditation on addiction and substance, are both powerful in their own right, but somewhat forced. Underwood is moving beyond her own experience and verges on that annoying pop superstar territory where they feel the need to pontificate on the very specific pain of others. The vocal performances are strong, but there’s a nagging detachment between Carrie and her subject matter that feels, frankly, like stolen valor (or in this case, sorrow). Still if a little borrowed sorrow is uncomfortable, at least it’s undeniably well executed. The same can’t be said for “The Kingdom”, a tediously OTT resolution to our tale of heartbreak (proof that not every story needs a happy ending). “The Champion” is arguably worse, although far snappier: a wailing expression of self-confidence and resolution whose incessant yearning for bland bigness obliterates any sense of individuality or self (and that’s in spite of a boisterous Ludacris verse). Cry Pretty deserves mixed reviews. The song writing, weighty subject matter, clever turns of phrase and bulldozingly powerful vocals deserve four and five star write-ups. The anodyne production, the faceless gloss, the risk free, don’t-dare-rock-the-boat, don’t showcase any color or spark ethos of the production deserves to be ripped to shreds in the most savage and unrelenting terms. Ultimately, it all comes back to that cover image. Carrie wants to drink, wallow, dwell, suffer and, most of all, to cry, but her label wants her to look pretty and sound safe. It’s the gutsy coming face to face with the gutless. Despite its crippling flaws, those teary-eyed narratives overcome Cry Pretty’s most inoffensive excesses. This is powerful stadium sized pop, almost in spite of itself. Carrie Underwood bares her soul with a selection of undeniably powerful and pleasingly vulnerable reflections on heartbreak. Sadly, the production on Cry Pretty seeks to sand away any potential edge or ugliness. Mercifully, the bourbon soaked and tear stained narratives overcome these anodyne arrangements. Bad taste cannot suffocate good songwriting, at least not today.